This article gives you guidelines on how to price your products and the typical process used in most companies. At a basic level the main constraints on pricing are the costs associated with your offer, customers’ willingness to pay and your competition (see Fig.1). Product costs set a lower limit below which prices are not viable in the long term. The upper limit is a combination of affordability for your target customers, how they perceive the value of your product and how it compares to the alternatives eg. your competition. There are three basic pricing strategies. Marketing skimming is setting your pricing high relative to major competitors and is often used if the pricing objective is to maximise profitability. Market penetration is setting your pricing low relative to major competitors and is often used to maximise market share. Finally competitor matching is setting your pricing at a similar level to the competition and is often used to maximise customer retention. If you’re the only product in the market or have a highly differentiated proposition but can only supply a small proportion of the market then a marketing skimming strategy is often best. This allows you to maximise profitability and use your high pricing to limit demand. However over time competitors will enter the market and undercut you. One strategy to defend a high-end proposition is to broaden your portfolio to include offers that also address the lower end of the market. Versioning, discussed in the Pricing Structures article, is a great example of this. Companies usually adopt a penetration pricing approach because they want to grab market share. However penetration pricing requires an iron-grip on costs and efficiency as it is often only with economies of scale that the product becomes profitable. 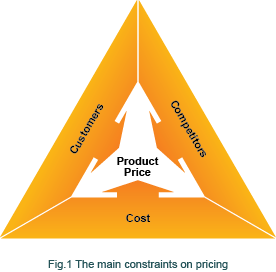 Each of these three pricing strategies has their merits and choosing the appropriate one depends on your pricing objectives, where your product is in its lifecycle and how differentiated your proposition is. Pricing strategy usually evolves during the lifecycle of a product category with a tendency toward the average price as markets mature and move into decline. These include, up-selling where customers are persuaded to buy a more advanced option, cross-selling where customers are persuaded to buy additional products in the portfolio (eg. bundling) and segment-based pricing where pricing is varied based on different customer segments (eg. students, employed, old-age pensioners). (Source) Read more . . .